The ADF-Q55 sets a new benchmark for high speed, high performance analog-digital conversion products. By compressing 4 TI 550Msps Analog-Digital Converters in the FMC form factor, DEG engineers have created the industry’s highest density high speed FMC product in the embedded marketplace. This FPGA Mezzanine Card (FMC) converts four channels of up to 2.0GHz analog input bandwidth at 550Msps and 12-bit resolution. Based on the VITA 57 specification, the ADF-Q55 enables direct coupling of unparalleled analog-digital conversion capability with the VME/VXS/AMC/VPX/PCI-E carrier board of your choice. DEG engineers have designed this product and associated HDL firmware to work with both Altera and Xilinx FPGAs. The ADF-Q55 is based on the Texas Instrument ADS5463 Analog-Digital converter. DEG engineers leveraged design work and intellectual property from the highly successful ADC-3595 PMC board to bring the ADF-Q55 to market in record time. By coupling this core architecture with the compact and flexible FMC form factor, DEG has enabled customers to rapidly and cost-effectively build compact & rugged systems with 4-8 channels of high-speed digitization in a single high performance processor/carrier board. This flexible approach reduces overall power consumption, footprint, and cost while increasing ruggedness and reliability. The DAC-D2500 asserts DEG’s leadership position in the high speed, high performance, digital-analog conversion market. This FMC card is based on the Analog Devices AD9739A DAC chip. Based on the VITA 57 specification, the DAC-D2500 enables direct coupling of unparalleled digital-analog conversion capability with the VME/VXS/AMC/VPX/PCI-E carrier board of your choice. DEG engineers have designed this product and associated HDL firmware to work with both Altera and Xilinx FPGAs. DEG engineers leveraged design work and intellectual property from the highly successful FMC product line to bring the DAC-D2500 to market in record time. By coupling this core architecture with the compact and flexible FMC form factor, DEG has enabled customers to rapidly and cost-effectively integrate the latest generation of analog-digital conversion capability with very high performance processor/carrier boards. This flexible approach reduces overall power consumption, footprint, and cost while increasing ruggedness and reliability. Quad-Channel up to 2.0 Gsps, 12-bit. Or Dual-Channel up to 4.0 Gsps, 12-bit. Based on the ADC12Dxx00RF family, the DWF-Qxx provides 4 channels of synchronized ADC channels - down to the MOMENT. Multiple DWF-Qxx boards can be synchronized with DEG triggering circuitry. This board is available now and is shipping. THe DWF-Qxx can be configured with any of the Texas Instruments ADC12D2x00(RF) devices to optimize for price/performance. Available in increments of 1.0, 1.6, 1.8, or 2.0 Gsps - and translates to 2.0 - 4.0 Gsps in DES mode. The ADF-Q40 sets a new benchmark for high speed, high performance analog-digital conversion products. By compressing 4 TI 400Msps Analog-Digital Converters in the FMC form factor, DEG engineers have created the industry’s highest density high speed FMC product in the embedded marketplace. This FPGA Mezzanine Card (FMC) converts four channels of up to 1.4GHz analog input bandwidth at 400Msps and 14-bit resolution. Based on the VITA 57 specification, the ADF-Q40 enables direct coupling of unparalleled analog-digital conversion capability with the VME/VXS/AMC/VPX/PCI-E carrier board of your choice. DEG engineers have designed this product and associated HDL firmware to work with both Altera and Xilinx FPGAs. The ADF-Q40 is based on the Texas Instrument ADS5474 Analog-Digital converter. DEG engineers leveraged design work and intellectual property from the highly successful ADC-3495 PMC board to bring the ADF-Q40 to market in record time. By coupling this core architecture with the compact and flexible FMC form factor, DEG has enabled customers to rapidly and cost-effectively build compact & rugged systems with 4-8 channels of high-speed digitization in a single high performance processor/carrier board. This flexible approach reduces overall power consumption, footprint, and cost while increasing ruggedness and reliability. The ADF-Q25 is DEG's fastest 16-bit ADC FMC product. 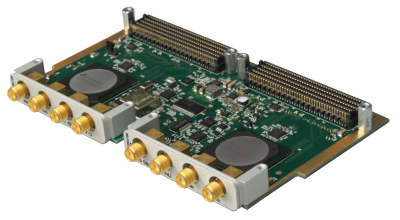 By compressing four industry-leading Analog-Digital Converters in the FMC form factor, DEG engineers created the highest density SIGINT FMC product in the embedded marketplace. This FPGA Mezzanine Card (FMC) converts four channels of up to 900 MHz analog input bandwidth at 250 Msps and 16-bit resolution. Based on the VITA 57 specification, the ADF-Q25 enables direct coupling of unparalleled analog-digital conversion capability with the VME/VXS/AMC/VPX/PCI-E carrier board of your choice. DEG engineers have designed this product and associated HDL firmware to work with both Altera and Xilinx FPGAs. The ADF-Q25 is based on the Analog Devices AD9467 Analog-Digital Converter. By coupling this core architecture with the compact and flexible FMC form factor, DEG has enabled customers to build cost-effective compact & rugged systems with 4-8 channels of high-speed digitization in a single high performance processor/carrier board. This flexible approach reduces overall power consumption, footprint, and cost while increasing ruggedness and reliability. The ADF-3000 reaffirms DEG’s leadership position in the high speed, high performance analog-digital conversion market. By leveraging previous ADC card designs and using E2V’s highest performance A/D converter, Delphi engineers have created an FMC card that leads the industry in both resolution and dynamic performance. This FPGA Mezzanine Card (FMC) converts a single channel of up to 5GHz analog input bandwidth at 3.0 Gsps and 10-bit resolution. Based on the VITA 57 specification, the ADF-3000 enables direct coupling of unparalleled analog-digital conversion capability with the VME/VXS/AMC/VPX/PCI-E carrier board of your choice. DEG engineers have designed this product and associated HDL firmware to work with both Altera and Xilinx FPGAs. The ADF-3000 is based on the latest offering by E2V and the emerging FMC form factor. E2V’s latest innovation, the EV10S152, sets the benchmark for high performance analog-digital conversion. DEG engineers leveraged design work and intellectual property from the highly successful ADF-2500 FMC Module. By coupling this core architecture with the compact and flexible FMC form factor, DEG has enabled customers to rapidly and cost-effectively integrate the latest generation of analog-digital conversion capability with very high performance processor/carrier boards. This flexible approach reduces overall power consumption, footprint, and cost while increasing ruggedness and reliability. The ADF-D2000 leapfrogs Delphi Engineerings' (DEG) previous Analog-Digital converter products that were based on National Semiconductor ADC's. DEG engineers designed this product to support the ADC12D1000, ADC12D1600, ADC12D1800 and the ADC12D2000RF devices enabling customers to select their sample rate optimized for their application and obtain the best dynamic performance. The ADF-D1600 provides the highest conversion resolution for sample rates above 1Gsps. This FPGA Mezzanine Card (FMC) converts two channels of up to 2.8GHz analog input bandwidth at 1.0, 1.6, 1.8, or 2.0 Gsps and 12-bit resolution. Additionally, this FMC can be used in an interleaved mode to convert a single channel at 2.0, 3.2, 3.6, or 4.0 Gsps and 12-bit resolution. Based on the VITA 57 specification, the ADF-D1600 enables direct coupling of unparalleled analog-digital conversion capability with the VME/VXS/AMC/VPX/PCI-E carrier board of your choice. DEG engineers have designed this product and associated HDL firmware to work with both Altera and Xilinx FPGAs. •DUAL 1.0, 1.6, 1.8, or 2.0 Gsps sampling rate at 12-bit. The ADF-Q1014 Quad Channel ADC FMC module from DEG delivers 14 Bits resolution at a sample rate of 1 Gsps . As a VITA 57 compliant FPGA Mezzanine Card (FMC), the ADF-Q1014 converts four channels of up to 2.0 GHz analog input bandwidth providing direct coupling of unparalleled analog-to-digital conversion capability with the PCIe/VME/VXS/VPX carrier board of your choice.